I know, I know, just another iteration of mikes melons! But, the strawberry really tones down the Papaya which I've always thought was a little overpowering in the original... Great shake and vape... I think it's awesome! Give it a shot! Sweetener to liking. 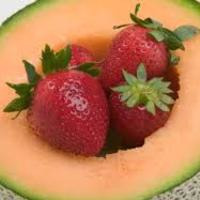 I've never tried Mike's Melons, having tried TFA Mango and TFA Papaya individually, it didn't look like something I wanted to try with those mixed together at such high %s. On one hand, I can't imagine this not being an improvement on the original. However, the papaya is overpowering here. I like TFA Papaya in moderation but it is a bully. I'm not really getting any cantaloupe, I'm not sure what TFA Mango is bringing to the table, and the little hint of strawberry is a tad waxy. Seems like a step in the right direction but more steps are needed - try even less papaya, a brighter strawberry, and something like FLV Cantaloupe and FLV Mango that will stand out against both if you really want a Papaya-Mango-Cantaloupe-Strawberry vape.